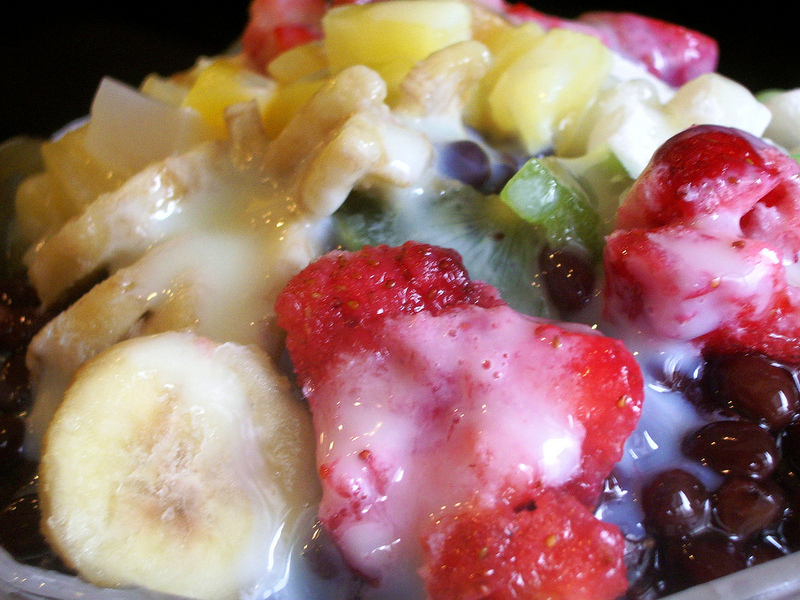 It’s been a year since I first did a piece on Patbingsu, the Korean summertime treat. I have since grown a fondness for it. It’s like a snow cone with lots of stuff thrown in and stirred together like bibimbap. It also seems to be more popular this year, with Patbingsu ice shavers, bowls and kits displayed in the entrances to supermarkets. I don’t remember them last year. Eun Jeong and I have been eating Patbingsu regularly. Our favorite one has been the giant SandPresso version, even though Eun Jeong said there was too much “Pat” (red beans) in the Patbingsu. Have you ever had this with ‘misu galu’? (it’s a powder made from the ground of various beans) the misu galu is really nutritious and it balances all the sweet flavors in the ‘popping sue.’ my gramma used to make it like this for me and it’s delicious. Yum. My mother loves to make this. At home, we use to have a hand cranked shaver, but luckily American fondness for shaved ice brought with it a wide selection of reasonably priced electric ice shavers. Reminds me of Philipino Halo-Halo…especially the sweetened beans.